Palestinian Prime Minister Ahmed Qurei has scrapped his proposed cabinet list and promised a fresh team after angry MPs threatened to vote him from office. Almost all MPs who spoke in a stormy parliament session opposed a cabinet they said was stacked with members of the old guard tainted by corruption. A new line-up of reform-minded technocrats will be presented on Wednesday, Mr Qurei told parliament. MPs stressed the need to break with the legacy of late leader Yasser Arafat. Correspondents say Arafat was known for picking his cabinet on the basis of candidates' loyalty rather than their competence. A cabinet of reformers could pave the way for Mr Arafat's successor, Mahmoud Abbas, to press ahead with a promised overhaul of the Palestinian Authority and peace efforts with Israel, correspondents say. The legislature had been expected to ratify the line-up on Monday but differences emerged among MPs over several new appointments. As the debate became turbulent, Mr Qurei slammed his microphone down twice as legislators complained that not enough changes had been made to the Arafat-era line-up. The prime minister needs the support of at least 43 of parliament's 85 members to endorse his choices. Correspondents say the dispute has raised the possibility that Mr Qurei could be toppled in a no-confidence vote. Jamal Shati, a Fatah legislator, said he would not agree to back the new cabinet. "This cabinet will pass only when it comes with names of those who are not involved in corruption," he was quoted as saying by the Associated Press news agency. Mr Qurei's list of 24 ministers only included four new names, most prominent of whom is Nasser Yousef, who was earmarked to become interior minister in charge of security forces. Before his death, Arafat had resisted appointing Mr Yousef, an ex-general, over fears he would be too independent. He would replace an old associate of Arafat, Hakam Bilawi, in the post. 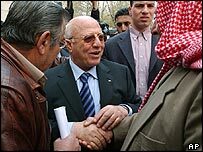 Former security chief Mohammed Dahlan, regarded as a key loyalist of Palestinian leader Mahmoud Abbas and negotiator with the Israelis, was Mr Qurei's choice to become minister for cabinet affairs. The Palestinian ambassador to the UN and Arafat's nephew, Nasser al-Kidwa, was named as foreign minister, replacing Nabil Shaath, who would become deputy prime minister.